3 Days, 3 Valleys Trek - Luxury Riad in Marrakech, Morocco. Book 3 Days, 3 Valleys Trek Today with Hip Marrakech - specialists in English Speaking Accommodation in Marrakesh, Morocco. "The 3 Days, 3 Valleys Trek offers a truly compressive tour of the Toubkal National park and a great introduction into traditional Berber life." The 3 Days, 3 Valleys Trek offers a truly compressive tour of the Toubkal National park and a great introduction into traditional Berber life. So why not spend 3 days exploring the Imnan Valley, the valley of Ait Mizan and the visually stunning Azzaden Valley on foot? Your experienced local guide will take you up and down beautiful hills and across deep gorges and gushing rivers, as you hike amidst juniper forests, pine trees and groves of Cherry and walnut trees. The valleys are also home to a plethora of Berber villages, home to herding and farming communities. During this trek you will be given an opportunity to meet some of the locals and get to know their traditions and customs as you get a glimpse of their daily life. 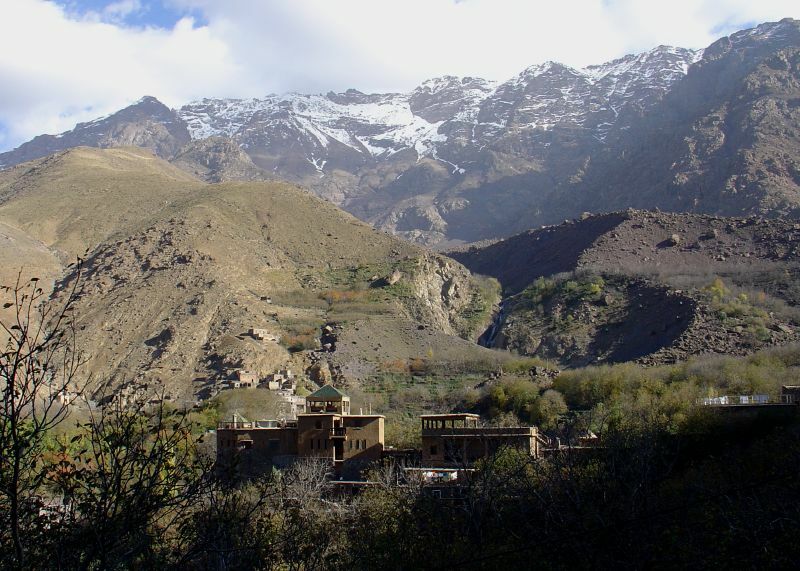 Drive from Marrakech to Imlil and trek to Tinerhourhine via Imnane Valley. After collecting you from Marrakech, we leave the city driving south towards the craggy peaks and plunging valleys of the Toubkal Massif. Crossing the Haouz Plain we pass through the tiny town of Asni, from where our road begins to climb towards the beautiful village of Imlil. Upon arrival at Imlil, we leave our vehicle and, in the company of our mountain guide, begin our Trek towards Tinerhourhine. After heading east across the winding mule tracks, we break for lunch at the Tizi n’ Tamatert (2279m) coll. The Tizi n’ Tamatert offer panoramic views of the surrounding area; from here you will see locals from the small Berber village collecting small bushes for firewood and, in the distance, the snow-capped Jbel Oukaimeden, Africa’s premier Ski resort. After lunch we begin our descent down to the picturesque Imnane Valley. As we meander our way towards to the Ouanesekra-Tamguist village, a plethora of small Berber villages cling to the sides of the steep hills offering incredible views and plenty of photo opportunities. We then head onto our destination, Tinerhourhine (1600m), where we will spend the night in a traditional gite. Trek to Aït Aïssa via Tizi n’Aguersioual & Matate. After an early breakfast, we depart from Tinerhourhine along the Imnane Valley. The second day of the trek is the longest and perhaps the most challenging of this 3-day excursion; but it is definitely the most rewarding. 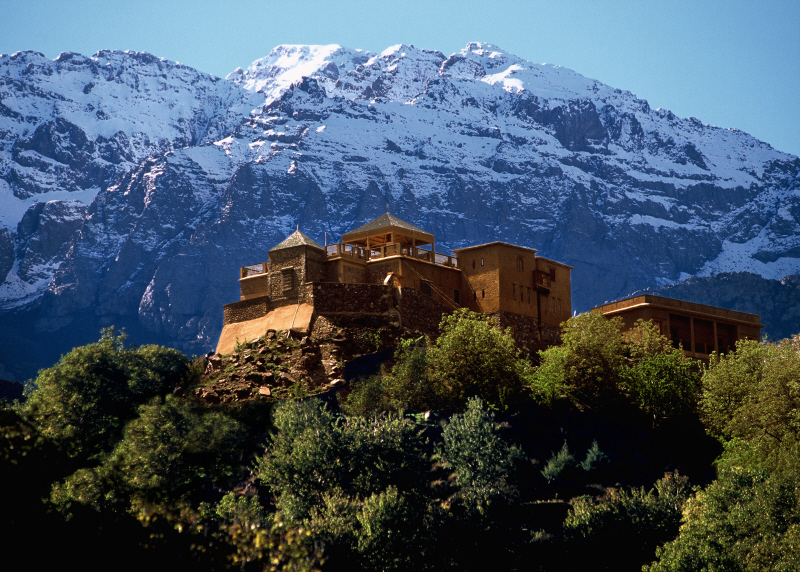 The first notable landmark is Ikkiss (1700m), a quaint Berber village with a population of around 600. Ikkiss is tucked away among green, cultivated, terraced fields – a significant feature of the Imnane Valley – and, as you pass the village, it is not uncommon for young, local children to join the trek in order to practice their English and French language skills. We then continue to cross the Tizi n’Aguersioual (2000m) coll and onto Matate (2000m), our destination for lunch. With renewed energy, we then press on to Aït Aïssa (1800m), our home for tonight. This section of the walk offers a wild juniper forest and walnut groves. After arriving at Aït Aïssa we will be gifted yet another opportunity to spend a night in a traditional local gite. Trek to Imlil via the Ait Mizan Valley & Mzik; return to Marrakech. The third and final day of this excursion takes us past some of the biggest waterfalls in the Toubkal National Park. We depart from Aït Aïssa and walk towards Tizi Oussem (1900m). We then pass by Tizi Mzik (2400m), which offers fantastic panoramic views over the Ait Mizan valley, the Jbel Oukaïmeden range, and beyond. We then descend down the steep pathways lined with palms down to the village of Mzik, before returning to Imlil where a car is waiting to take you back to Marrakech.